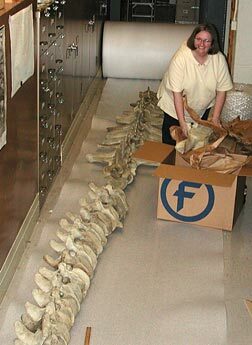 Museum Scientist Pat Holroyd packs up some bones of an extinct Stellers or Great Northern Sea Cow for shipping. This specimen, found in Alaska, represents a species discovered and then hunted to extinction in the 18th century. The San Diego Museum of Natural History, in putting together an exhibit featuring the skeleton of a similarly-sized fossil sea cow, found that they were missing some of the vertebrae. In order to complete their new display, they asked to borrow some vertebrae from this UCMP specimen for molding and casting.